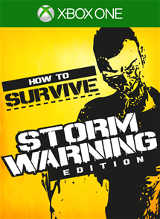 How to Survive: Storm Warning Edition is a next gen update to the XBLA game How to Survive. This updated edition includes all the DLC for the original game. I’ve never got a chance to play How to Survive on 360 so I don’t know if this is a graphical or engine update also. How to Survive is a top down 3D twin stick zombie adventure game. The game can be played in either Single or Co-op play and has you exploring islands trying to get enough parts to fix your seaplane and escape. The Tutorial is told through a series of survival guides written by a NPC in the game named Kovac. They play out in funny little pictogram skits within each book you find teaching you about your inventory, eating and everything else you need to know to survive. Genius tidbits like don’t sleep in the wide open as a zombie is going to come and eat your face. Stuff you need to know. These guides come into play in a nice loading screen mini quiz where correct answers gain you XP. It’s a nice bonus and the game only loads between islands so you can stay immersed the entire game. This game is pretty brutally hard. Besides trying to keep your body safe from rampaging zombies, you need to manage your thirst, hunger and tiredness also. Of all of these thirst seem to be the hardest to maintain. There are some fruits that help with thirst but for the most part you are relaying on wells that are on the islands. The biggest issue is once you use a well, it’s done. Everything else in the game seems to regenerate on a timer but as so far I’ve yet to see a single well re-fill. It is also extremely important to keep up on the weapon damage curve. Not finding the one part to get the next bow really puts you behind and makes the game a drag as you tackle not only health but the thirst, hunger and tired levels wasting time trying to find that part. The game is played out over a series of islands where for whatever reason each boat can only go to one other island. So you get the engine starter for the boat on Los Riscos Island and that gets you to La Vendida Island and it’s not a one use boat. You can now use it to go back and forth as often as you like. But on La Vendida Island there is a new boat to get you to the next island but it needs a fan belt or something. Why am I not just using the boat I already fixed up? It would of been more realistic to make me continue to upgrade the same boat and just have islands be further out. One of the biggest issues with the travel system is that any zombies in the area you are heading to will already be hitting you before you gain control. I’ve died quite a few times just by leaving an area and coming back to a horde or zombies waiting for me. There is no way around this, you need to dodge and roll and pray you get out all the while taking hits you don’t deserve due to no safe zones around loading area. There are quite a few punishing areas that seemed to be there just to hurt the player for no reason. During the games storms you’ll be hit my lightning a TON of times taking massive damage. There are near invincible crocodiles that sap your ammo with how much of a bullet sponge they are. Don’t even get me started on the bear that appeared out of no where and wrecked havoc on my inventory, destroying precious and rare items every time he hit me. How to Survive has a very complex and interesting inventory system. There are just so MANY items to keep track off and so little space to keep them. I have tires and bones and special plants and all kinds of stuff that I don’t know when I am going to need it or even if I am going to need it. Things can be combined in multiple ways but early in the game their effectiveness is not known. It does add to the difficulty in a very thematic sense as it adds to the unknown factor of your character’s journey. Do I need this plant or is this tire more important? As a player though I hate having to throw something away without knowing it’s purpose or value. When you find a blueprint it will be added to your guide and you’ll know 100% for sure what you are going to get when you combine two items, but the game doesn’t hold you back from experimenting. It doesn’t give you bad options, meaning you will always make something usable, but without finding the page it’s a complete guess as to what is going to be the final product. The game also has multiple stage creations. Your first gun is going to be 5 parts added one as a time until you end up with a makeshift gun so there is some good depth here. If you have the inventory space you are allowed to dismantle items back to their original parts so that you can incorporate new and better things. My biggest piece of advice is to drop your extra items near a boat or safe house. This way you can find them later if you figure out later they are needed. The biggest problem for me is just finding the items. The game doesn’t highlight or give you an indication that something can be used until you are right up on it. There are tons of things just sitting in the tall grass you’ll walk on by 20 or more times until you finally walk over it and get the press A to pick up. The story is your typical horror survival. Wake up on island, don’t know why you are there, just that you want to get away from the zombies. The voice acting is decent and each mission will have a little intro from the character and what they want. One of the major downfalls is that the gameplay started to get quite repetitive quickly. Every single mission you will undertake is a fetch quest. This boat needs this part, I need this thing to give you this other thing to give to someone else to get the thing you actually want. Again and again and again. The only thing that changes is the island you are on and although they’ll add some new enemies all the islands really look the same. The layout will change but from a glance you are not going to know one from another. There are a few other modes that have been added to this version that were DLC for the original. There is a challenge series you can do single or co-op. Get to the plane fast, kill all the zombies, that sort of thing. Then there is also a randomly generated island where the layout is the same but what resources and where they are scattered. You also get additional characters to play through with and some alternate costumes that have added bonuses. Overall How to Survive is an interesting take on Zombie Survival with its Thirst, Hunger and Tired system and it has an amazing crafting system but overall the game started to drag with its near endless fetch quests. If you like the survival genre then there are a lot of new concepts and ideas that push the genre forward in good directions and these additions overshadow the game’s shortcomings.